A model of Mr. Blizzard in Mario Party 9. Mr. Blizzards, also known as Spinning Snowmen, are living Snowmen in the Mario franchise that hop up and down and throw snowballs. Mr. Blizzard in Super Mario 64 and Super Mario 64 DS. Mr. Blizzard from Super Mario 64 DS. In Super Mario 64 and Super Mario 64 DS, they are found in Cool, Cool Mountain and Snowman's Land. They hide in the snow until approached, at which point they will pop out and throw snowballs at the player. They can be defeated by throwing a box at them, or circling around them until they disappear. Two others, found on a bridge in Cool, Cool Mountain, simply jump back and forth across it, and pay no mind to the player. In the remake, Wario can defeat them with a punch and Yoshi can defeat them with an egg projectile, and can also melt them with his fire breath while using a Power Flower. In Super Mario 64 DS, as with many of the enemies, their look is updated, though their attack pattern remains unchanged. They now have a zigzag mouth, wear a blue bucket for a hat and have a solid yellow mitten instead of a yellow one with a single pink stripe. They can be defeated by spinning until they shrink, instead of falling on their side and shrinking. Unlike in the original version, Mr. Blizzards do not respawn after Mario walks far away and returns to that spot. In Mario Pinball Land, they appeared in the Frosty Frontier Stage. 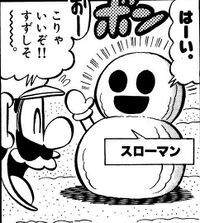 Unlike their other appearances, they do not throw snowballs, and unlike many other enemies in the game, they cannot be defeated simply colliding with Mario. In Dance Dance Revolution: Mario Mix, Mr. Blizzards are found in Freeze Mountain. In the Mario Kart series, Mr. Blizzards usually appear as obstacles, but are often replaced with generic Snowmen. Mr. Blizzard in a desert from the Mario Party 3 adaption of Super Mario-Kun. Mr. Blizzard's first appearance in the Mario Party series was Mario Party 3. In this game, they appear as a battle partner. As a battle partner, Mr. Blizzard has 3 HP and 1 attack point. His special ability allows him to always hit the farthest target. 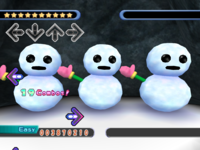 In Mario Party 4, they appear in the minigame Mr. Blizzard's Brigade, now with a giant version which throw bigger snowballs. In Mario Party 5, Mario Party 6 and Mario Party 7, Mr. Blizzards appear as the Mr. Blizzard Capsule. When an opponent lands on the space with the orb, a Mr. Blizzard falls on the player, causing them to lose all their orbs. In the minigame Later Skater, a few Mr. Blizzards make appearances out of bounds. A unique Mr. Blizzard appears in Mario Party Advance, at the Ice Stadium. A generic Mr. Blizzard also appears within the snow globe of Snow Globe. In Mario Party 8, Mr. Blizzards appear in the minigame Alpine Assault. Their only purpose is to obstruct the player. In Mario Party 9, only two Mr. Blizzards appear, larger than their past incarnations. They are in the minigame Snow Go, in which they attack the player by tossing snowballs at them. Getting hit by a snowball results in the player being frozen. In the Museum, a constellation called Cold Guy based on the snowmen can be purchased. In Mario Party: Island Tour, Mr. Blizzard is the third boss to be fought in the Bowser's Tower mode (being faced off against on the fifteenth floor). He hosts the minigame, Mr. Blizzard's Snow Slalom, where the player rolls into him with snowballs. Meanwhile, Mr. Blizzard throws damaging snowballs at them. In Mario Party: The Top 100, some Mr. Blizzards reappear out of bounds in the minigame Later Skater from Mario Party 5. Mr. Blizzard also makes a cameo appearance on the box art from Mario Party 3 in the Collection mode. Mizzter Blizzard, a Mr. Blizzard wearing a Royal Sticker, appears as the boss of World 4 of Paper Mario: Sticker Star, and also marks the species' Paper Mario debut. In Super Mario 64, if the player loses Mario's cap in Snowman's Land and then exits the game and goes back to the course, then a Mr. Blizzard will be wearing Mario's cap. Surōman Throwman, also pun on "snowman". This page was last edited on April 7, 2019, at 13:45.